The old joke is that Steampunk happened when Goths discovered brown. Ok, so there's some truth to that. It's Captain Nemo meets Barbie's Dream House - and I love it. How great would this be with steampunk home decor? Or, for you cosplayers, how about a little NerfPunk? Here's the concept: steampunkers are known for painting/customizing Nerf guns into steampunk guns. 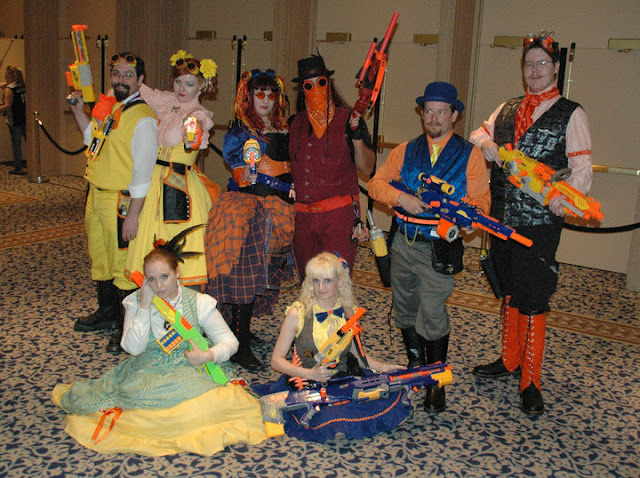 So this group figured, hey, why not match our costumes to the guns, instead of vice versa? Aaaand NerfPunk was born. Frankly, I think it's brilliant. I'd love to see more bright colors like this worked into the Victorian/punk aesthetic. Or, if you can't work that much color into your costume, how about in your hair and makeup? Someday, guys, I am going to have candy colored hair. Someday. Over the past few years a lot of 'punkish elements have worked their way into my closet. Leather boots and ruffled skirts, fitted military jackets, big belts, and flouncy blouses all add up to a subtle steampunk look that doesn't look costumey. Still, most of those tend to be muted khakis, browns, and army greens - not very colorful. And, in case you hadn't noticed, I LOVE color. You also see a lot of jewel tones in the more traditional Victorian dresses used so often in steampunk costuming - lots of rich reds, teals, and purples. (Some examples here.) It's fun when you see colorful satins paired with rugged leather: such a great contrast. Well, I could keep going all day, but I think that's enough for now. 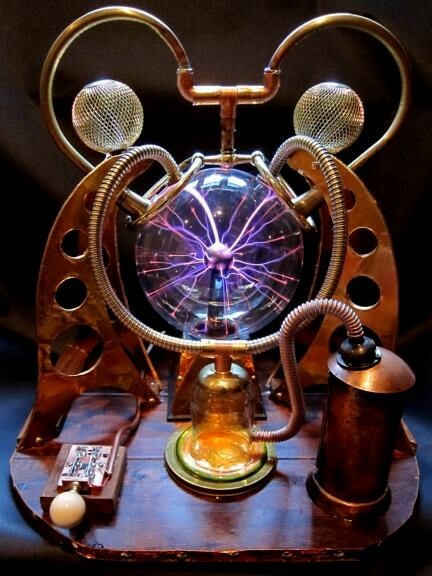 If you have any examples of colorful steampunk, please link to them in the comments! Candy colored hair is probably my favorite thing ever! Unfortunately I work in retail cesspools that want "natural" colors... I will have candy colored hair... again! And I love the second chandelier, something about it screams "This is all a dream, but a good one you will remember fondly"
I agree with the browns and golds. I went to the World Steam Expo in Michigan over Memorial Day weekend. I tried on a corset at my friend's booth, and I was SO EXCITED to find a black and ice-blue corset, but the ice blue fabric had a pattern of watches/clock faces on it. It will be my next big purchase! I want to make an ice blue, black and pale purple steampunk ensemble now. The girl who makes the corsets has a motto of "bringing pink to steampunk". All of her costumes involve some shade of pink in them, for a very similar reason. Victorians loved color! Just because photographs were sepia, doesn't mean they were all wearing sepia tones! Love Bionic Unicorn's work...I have a couple of her pieces!! One was Bioshock-inspired, so I had to have it!! I would like to create a pink steampunk outfit for next year's AnomalyCon. I'm not quite brave enough to go with candy colored hair all the time but I have several technicolor wigs. My favorite I got at a wig shop and was around $70 but I have 3 others I got on Ebay for around $30-$40 each. And I'm always looking for new interesting ones. Just an option for people who love the look but either don't want to do it all the time or can't because of their jobs. @ Sheri C - That sounds beautiful! Does the corset-maker you mentioned have a website you can share? How about this? Is that colorful enough for you? When I was researching for my wedding, which was kinda "Alice" themed, I came across this: centerpiece which I love, but it is so bright, it kinda scares me. I was totally looking at the NerfPunk picture and thinking "wow, that's awesome, I totally love the bright colors" when my brain did a lateral slide and I totally realized that the new TARDIS control room on Doctor Who has totally a bright-colored quasi-steampunk thing going on. 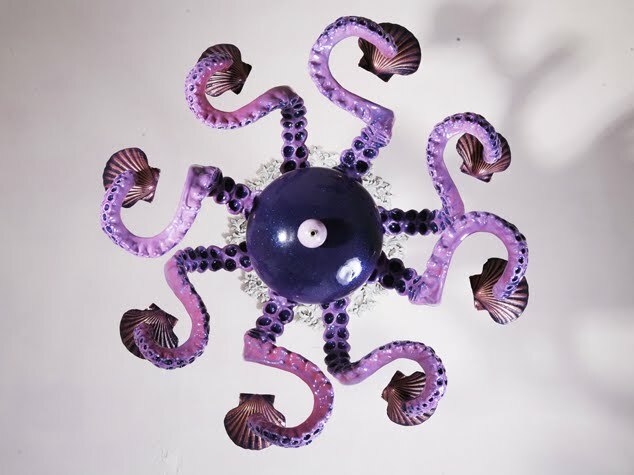 Following on from the octopus chandeliers I want to do some shameless showing off. I found this ring while procrastinating one day and fell in love. Unfortunately, being an impoverished student I don't have a spare $248, so I decided to make one myself. I'll not bore you with the process, but here's the finished article. I'm rather pleased with him! Not sure if you've seen them, but now Disney has Steampunk pins. We saw Mickey, Donald and I think Stitch. The great part about your job is that you don't have to be in the public eye 24/7 and try to be "taken seriously," so you can have whatever color hair you want! if you ever go back to Portland, Or for another book tour, or just vaca like I did, you must MUST go into the Sock Dreams store! Rock your socks awesomeness! Having recently had some very vivid purple added to my dark brown hair I can only say:Go for it! It has been extraordinary. I love that I can hide or emphasize the purple depending on how I do my hair. So much fun. Mostly good reviews too. Jen, since you have the same problem I've known others to run into - over-the-knee = crotch - try checking out the kids sizes. If you get the largest kid tights you can find, then they usually are good for petite ladies. Also, if my over-the-knee socks ends up being to the middle of my thigh (I am also short), I wear a pair of 3/4 tights underneath them. They look awesome that way for my pirate costume. A flouncy shirt with a big belt or a short skirt would really look cute as well! He hand made a gas mask out of a corset. Not necessarily colorful, but definitely feminine and just gorgeous. It was a lot neater on the show! The artist is Wren, his website is www.purevile.com. Oddities is a great show, based around this place: Obscura Antiques and Oddities I have seen some great stuff on the show. Some is incredibly macabre, but there's a lot of fun people that come in and they are so entertaining. I know it's slightly more Disneyland rather than Disney World, but did you hear that Wally Boag passed away? oh mah gawd. 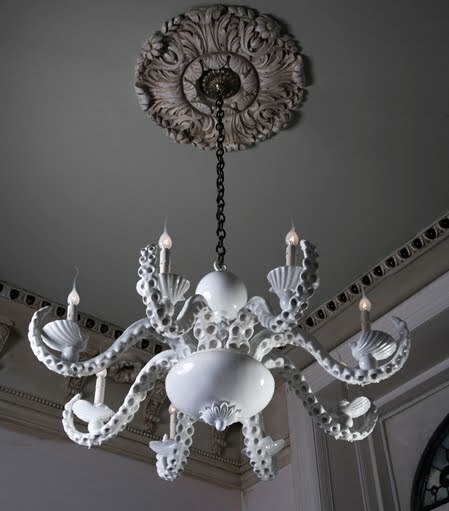 I LOVE those octopus chandeliers! I NEED them. 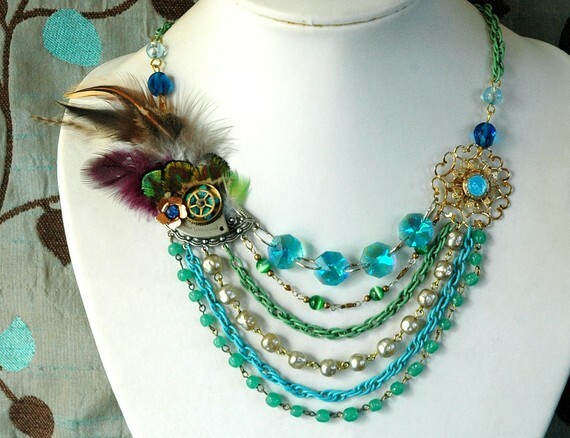 Sadly, my hubby probably won't agree *pout* That last necklace is freaking gorgeous too. WANT. Thanks for posting the pretties!! Awesome post, as per usual. ...Does anyone know if there is a 'name' for the pattern of those over-the-knee socks? I kinda want a tattoo with that pattern. so i was stumbling around the web and found these sites. thought you might like em. From the other side of the world, a small town in New Zealand called Oamaru has taken steampunk to heart. This weekend (a long weekend in NZ) they had a fashion show. I dunno about steampunk, but those socks reminded me of some great ones from sockdreams.com. They have a variety of socks - some of which could be worked into a steampunk costume. Some of them are just fun for every day, too. And they have free shipping. I feel your pain with the socks, Jen, only the inverse. I'm so tall (with the size 12 feet to match) that "over-the-knee" = "crew socks" for me. Heh. I'm going to Dragon*Con this year (My first!) and I'm going in a bridesmaid gown that is being steampunked by a friend of mine. My sewing skills add up to zilch. I've been having a blast cannbalizing old alarm clocks for their gears and trying to find tiny touches that will make my dress look right. My favorite addition so far is the old brass from some water hoses that will adorn my fingers like a crazy set of gardener brass knuckles! On the website are recordings of old Disney vinyl records, plus photographs of the album art. Thought you might enjoy it. Love your website, especially when you post stuff about Dr Who! @Jen Silly me! Sorry, didn't think to post the link. Her website is http://www.tiesthatbynde.com/ and her facebook page is here. She does custom work, although she has a set of "off the rack" designs. The only thing to consider, for those readers that don't live in Michigan or the surrounding area, is that she really prefers to do in-person measurements and fittings. Otherwise she will not be held responsible for things that do not fit. She knows what measurements she needs, and prefers to not rely on someone measuring themselves. LUUUVED the hidden mickey reference. Made my day. Fell in love with this blog all over again. Happens at least once a week. 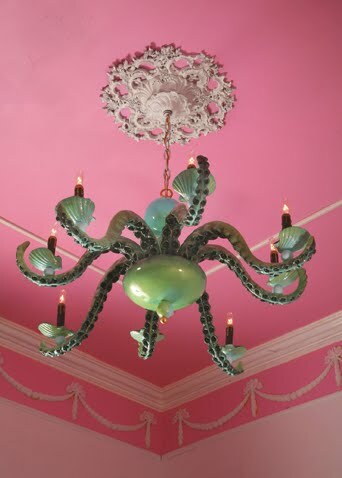 I am OBSESSED with the Octopus chandalier!! My husband said we could get one, and i am scared to death to find out how much those bad boys are. We are doing the front of our house in a Captain Nemo/Stempunk theme, and i think we need that light!! I wish I had that problem with socks.... Sadly I am so tall the over the knee = knee high, knee high = ankle socks, and ankle socks = useless toe warmers. You could always pretend the socks are stockings and hold them in place with a garter. I just wanted to post an update, in case anyone was interested in the hand made corsets that my friend makes. I asked her specifically about out of state orders. She said that if you contact her, she'll tell you what measurements to take, and she'll work with you to see if any of her off-the-rack corsets would work. When I say off-the-rack I just mean they're made using already created patterns, instead of being custom drafted. They are still all hand made. my red steampunk getup.I dont like brown alot, much prefer a bit of rich colour..i call my look steamgoth lol! I made the entire outfit, except for the parasol. I was wondering if there are Hair Pieces for curly hair. I’m a mixed girl, Mexican and African-American and my case is coming to the point where I can’t hide it anymore. I have hair growing all over my head about 2 to 2 1/2 inches long, while the rest ( about 30%) is still its normal length. I would like to know if this product will also allow me to play sports because I’m a high school athlete and if I can also swim with it. I basically want to know if it’s just like real hair and will these help prevent me from continuing to pull? Thanks!